Some dog owners prefer to have their pets groomed by the pros in doggie salons, while others opt to take the DIY route and groom their pooches by themselves. Grooming your dog at home may not be that easy, but it is definitely doable. One of the most common reasons why dog owners choose to groom their own canine companions is the cost of professional grooming services. Doing it yourself at home properly is a lot cheaper, of course. If you add up the professional grooming fees and the cost of gas (provided you drive to the doggie salon), you will find that purchasing a set of grooming tools is much more cost-effective. After all, you only need to pay once for the shears, brush, and nail clippers. Still, you need to be careful and use the grooming tools correctly so as not to injure your dog or give him an embarrassing haircut, either of which will only have you end up spending more money. Another reason why dog owners groom their pets at home is to bond with them. Although your dog might be uncomfortable with the grooming tools at first, he will relax once he understands that they will not hurt him. Also, your dog won’t be as nervous when he is being groomed at home, since he is in a place he knows well and is surrounded by people he trusts. Dogs enjoy being groomed because it keeps their hair at a comfortable length and gets rid of pests and diseases. When you are grooming your dog, he will know that he is being taken care of and will love you even more. For you, it can be a time to unwind a bit while pampering your pet. * Hair brushing. Most dogs like being brushed and this maintains a healthy coat. * Bathing. 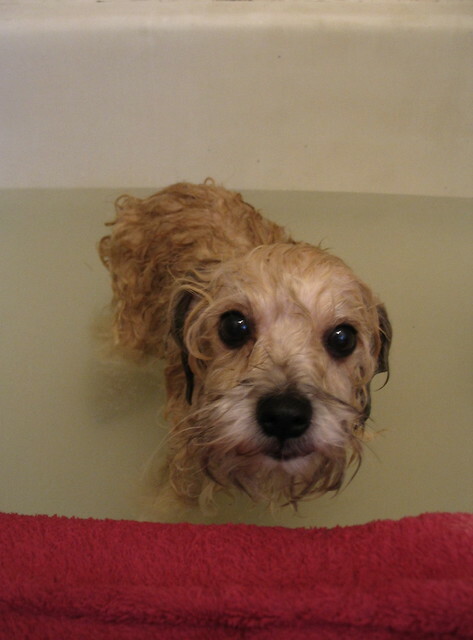 Always use a soap-free dog shampoo. * Nail trimming. Don’t cut nails too short – it will hurt your pet. * Haircuts. How often this should be done depends on the breed. * Ear care. Your dog’s ears can collect yeast and bacteria if they are not kept clean.